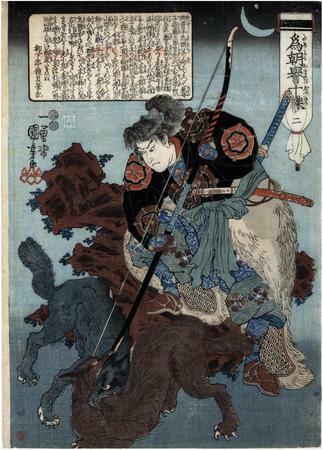 Basil Robinson wrote in Kuniyoshi: The Warrior Prints (page 147): "Tametomo separating two fighting wolf-cubs with his bow. He had lost his way on a hunting-expedition; the cubs put him right, and he kept them as pets, naming them Nokaze and Yamao." This image comes from a series of prints by Kuniyoshi based on the novel, Chinsetsu Yumiharizuki, by Takizawa Bakin, published in the early years of the 19th century. The story of Tametomo and the fighting wolves seems to come out of the fertile mind of Bakin. Here "...Tametomo separating two fighting wolf cubs, who he named Nokaze and Yamao and kept as pets..."
There are three prints from this series in the Lyon Collection. The other ones are #s 180 and 1102.